GPHAP was founded in 1934 and celebrated its 80th anniversary in 2014. Michael M. Davis, founder of the program, had a Ph.D. in sociology and was an innovator in hospital administration, a formidable advocate for new methods of delivering and paying for medical care, and an important participant in the formation of the social security system. 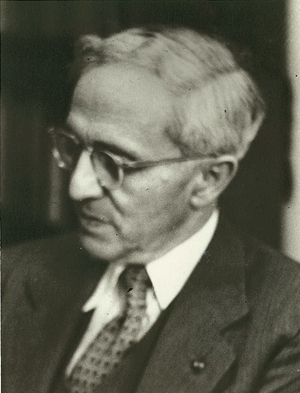 He had visited hospitals in the early 1930's across the country as a privately practicing consultant and he found that many hospital superintendents were inadequately trained for their positions and were absorbed in the details of institutional administration – for instance, in housekeeping – rather than in the larger mission of efficiently and fairly delivering health care to the public. Davis also recognized that most hospital administrators lacked proper training in business – in accounting, administrative statistics, and in managing supplies. To correct these deficiencies, Davis envisioned a systematic teaching program in which successful practicing administrators could disseminate their knowledge under the legitimizing auspices of a university. Davis found support for his unique idea at the University of Chicago through the deans of the Graduate School of Business and the medical school and from faculty in the Department of Sociology and School of Social Service Administration. He began the Program in Hospital Administration in 1934, the first program of its kind in the world. The program was placed in the business school, for purely practical reasons, according to Davis; the founder firmly believed that traditional business subjects were crucial to the hospital administrator’s education, but that the primary objective of hospital administration was broader than just organizational management. Davis believed that the new professional hospital administrator must possess a balance of business skills and social vision and saw, even in 1934, that escalating medical technology would demand more competent and widespread administration of its benefits. Subsequent directors of the program generally maintained Davis’s original educational model: one year of academic coursework followed by a residency. During the first thirty years of the program, fifteen other universities began hospital administration programs based on Davis’s Chicago model. By the 1990's more than fifty graduate programs operated across the nation. The program began its vigorous alumni association in 1942, and the Chicago program’s alumni and directors have dominated leadership positions in the field’s most important profession associations: for instance, Arthur C. Bachmeyer, M.D., director of the program from 1935 to 1951, headed the Commission in Hospital Care in the 1950s, Andrew Pattullo (class of 1942) was influential in establishing the Association of University Programs in Health Administration, as was Ray E. Brown (class of 1945), the program’s director from 1951 to 1962, who was chairman of the committee that led to the creation of the AUPHA. Brown was also president of the American Hospital Association from 1955 to 1956. George Bugbee, director of the program from 1962 to 1970, headed the AHA from 1943 to 1954 (the first non-physician in that role). Bugbee was instrumental in the 1946 passage of the Hill-Burton Act, legislation that provided funds to build new hospitals needed after a lapse in construction during the Depression Era and World War II. Bugbee also headed the Health Information Foundation in New York, which was transferred to the University of Chicago in 1962 and renamed the Center for Health Administration Studies – the center that flourishes here today. Bugbee instituted changes in the emphasis of the program’s curriculum that remain today. The apprentice model – four quarters on campus and about a year of internship in a hospital – changed in the 1960s; business schools across the country strove to teach general business principles that could be applied to all organizations. The trend agreed with Bugbee’s philosophy that two years in residence at a university served the student better than an internship: Bugbee, a highly experienced administrator himself, believed students had the rest of their lives to gain practical experience. This academic orientation continued after Bugbee’s directorship with Bugbee’s protégé, J. Joel May (director from 1970 to 1977), and subsequently, Odin W. Anderson (director from 1978 to 1980), and Ronald M. Andersen (director from 1980 to 1990) – both outstanding career researchers in health services. “I do not wish to see the essential business subjects neglected in the curriculum. I do think that much emphasis should be laid on medical objectives, professional organization and relations, and that more time should be given to community organization and relationships. I might add that the teaching of community organization in some of the schools of social work might be studied to advantage, for in my observation it is superior to the teaching of this subject in departments of social science, where the focus is often on analysis instead of on analysis as a tool for action” From: "Development of the First Graduate Program in Hospital Administration,” The Journal of Health Administration Education, Volume 2, number 2, spring 1985, pp. 121-134.